John Joseph Kelly was born on November 26, 1915, in DuBois, Pennsylvania, the son of Dennis Kelly and Mary Reilly. He was baptized on December 5, 1915 at St. Catherine’s Parish, DuBois, and attended elementary school at Jenks Hill Public School and St. Catherine’s Grade School. He continued his education at St. Catherine’s High School and then, in 1933, entered Augustinian Academy, Staten Island, New York as a postulant. He was accepted into the novitiate at New Hamburg, New York on Sept. 8, 1934, and professed simple vows on Sept. 10, 1935. He then studied at Villanova College, graduating with a BA in June, 1939. He professed solemn vows on March 10, 1939. He pursued theological studies at Augustinian College from 1939 to 1943, and obtained a MA from The Catholic University. He was ordained to the priesthood in Trinity College Chapel, Washington, DC, on May 28, 1942. From 1943 to 1949, Fr. Kelly served in Cuba at our parishes of San Agustin and Santa Rita, and at the Universidad de Santo Tomas de Villanueva. In 1948 he completed his Doctorado de Filosofia y Letras at the Universidad de Havana. In 1949 he served for one year at the newly founded Merrimack College, North Andover, MA, and then in 1950 returned to the Universidad de Santo Tomas de Villanueva, Marianao, Cuba, where he was named Vice President and then, in 1951, President of the University. Having been forced to leave Cuba by the Communist government in 1959, from then until 1962 he served at St. Augustine Parish, Lawrence, MA, and taught at St. Augustine High School, San Diego, CA and St. Nicholas of Tolentine High School, Bronx, NY. In 1962, Prior General Luciano Rubio asked Fr. Kelly to serve at Iglesia San Agustin, Santiago, Chile. He was there from 1962 to 1964 and served for several months each of those years helping the Midwest Province in the Peruvian missions. 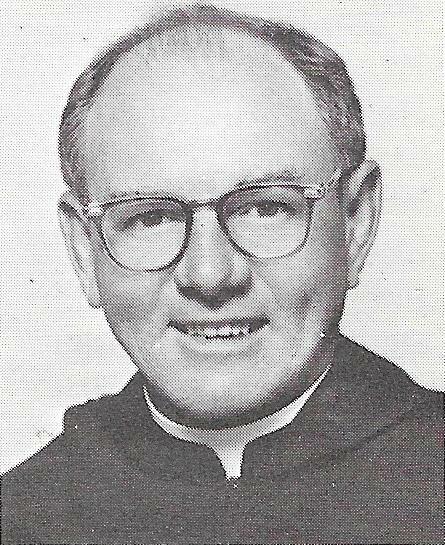 In 1964, Fr. Kelly returned to the United States and served in the California Province at St. Patrick’s Parish and St. Augustine’s High School in San Diego, and Our Mother of Good Counsel Parish, Hollywood. In 1976, Fr. Kelly requested assignment to the missions in Peru and he worked there until 1985, when, at the age of 70 and because of failing health, he returned to the United States and served at Biscayne College/Saint Thomas University while a member of the community of Casa San Lorenzo. In Miami Fr. Kelly ministered to the large Hispanic, especially expatriate Cuban, population, to fostering the work of the university in its development of its Spanish-speaking campus, to serve the alumni of the Universidad de Santo Tomas de Villanueva, and to encourage many religious groups, especially the Spanish-speaking Augustinian Seculars of the area. During this period, on several occasions, Fr. Kelly attempted to return full-time to the missions in Peru, but each time his physical health could not keep up with his missionary zeal. He represented the Province in Peru for the opening of the cause for canonization his close friend, John McKniff, O.S.A. in 2000. Besides writing a brief biography of Fr. McKniff, Fr. Kelly wrote a biography of Fr. Lorenzo Spirale, OSA, God’s Street Sweeper, and other publications about the Peruvian missions, Adventure in Faith: The Story of the Chulucanas Prelature, and Morropon Mission Letters. He also wrote a brief history of the Universidad de Santo Tomas de Villanueva. In his last years Fr. Kelly suffered from deteriorating health, but continued to be as active as he could in ministry and in community at Casa San Lorenzo. He died around 3pm on Friday, August 25, 2006, a few months shy of his 91st birthday. A Memorial Mass was celebrated at the Saint Thomas Monastery Chapel, Villanova University on August 31, 2006. On August 30, a Prayer Service, Viewing and Visitation was held at the Chapel of Saint Thomas University, Miami, and the Funeral Liturgy took place place on August 31, 2006 at Saint Augustine Catholic Church, Coral Gables, FL. Fr. Kelly is buried at Our Lady of Mercy Cemetery in the Miami area, near his confrere and friend, Fr. John McKniff, O.S.A. Older Post James M. Kelly, O.S.A.